After years of trying and failing to have a good marathon, I walked away from Sunday’s race beyond thrilled and beyond proud of how I ran. At long last, I caught my white whale: I conquered–really, truly–conquered the marathon. To say that I had a bad attitude going into Sunday would, I believe, easily qualify for my biggest understatement of the year, if not my life. I don’t think it’s been any enormous secret that I was extremely disappointed with my training cycle and felt utterly unprepared to run 26.2 miles on Sunday. I didn’t doubt that I would finish, but I also knew I didn’t have a prayer at finishing in under five hours, and to be frank, that pissed me off. I have never been happy running a 5:00+ marathon before, and I was quite confident I wouldn’t be happy running a 5:00+ marathon this year. At the same time, I had this stubborn, smoldering flicker of hope deep, deep down inside me that kept whispering in my ear, “But what if this is your year? What if you really do run a 4:45 this time?” I hated that hopeful voice. I wanted to stomp on it, smother it, crush the life out of it. I knew, barring a major miracle, that I didn’t stand a chance at running a 4:45 this time around, and it infuriated me to no end that I couldn’t get that persistent liar to leave me alone. Sunday dawned without a cloud in the sky, because apparently this is the only kind of weather we get on marathon day (seriously, according to the Chicago Marathon Media Guide’s Historical Weather Conditions entry, October in Chicago, on average, has seven clear days, 8.75 partly cloudy days, and 14.7 cloudy days. Even though the odds are MUCH better that we’d have a partly cloudy or cloudy day, somehow I have never [thus far] run a Chicago Marathon under anything but crystal clear skies.). I headed to Grant Park, swaddled in an old mylar blanket, my stomach rumbling with anxiousness. It took a little while to get into Grant Park, but once I made it through the bag check station, I put on some sunscreen (forgetting, I discovered after I got home, my chest, which is now a lovely shade of red), checked my gear, and got into the longest portapotty line of all time. I don’t know why I always assume the portapotty lines at the Chicago Marathon are going to be fine, because they never are, but it still drives me crazy every year. I had originally been assigned to Corral K for this year’s race, but since I had NO desire to start that late in the day, I requested to be moved to Corral G and the race complied (really, that’s all it took. I just had to ask, and I was moved, no questions.). I originally thought about finding a 5:15 pace group to start the race with, but since 1) there were no 5:15 pace groups and 2) the slowest pace group in Corral G was for a 4:10 marathon (lol ok), I quickly realized that wasn’t going to be an option. I decided instead to start at the very back of Corral G to avoid getting swept up in any early race madness and plod along at an 11:30 pace (just a hair slower than a 5:00 pace) for 13 miles, then reevaluate. Ideally, I wanted to pick it up to an 11:15 pace for miles 13-19 and an 11:00 pace for the last part of the race. I didn’t know what kind of finish time that would get me, but I figured it would be under five hours. At the same time, though, I knew expecting myself to speed up that much on the second half of the race would be extremely difficult. I was a little nervous about going out at an 11:30, because even thought I thought it should be sustainable for 26.2 miles, I knew it was risky. If I needed to slow down, it was going to end up being a pretty dramatic slowdown, and I wasn’t interested in that at all. I manually lapped my watch for the entire race (except mile 26. I never saw a mile 26 sign! I don’t know if it wasn’t there or if I just didn’t see it, but either way, my last lap on my Garmin stats is for 1.2 miles, not one mile. ), and when I hit mile one, I was extremely pleased to see that I had somehow managed to run an exact 11:30 pace for that mile. Boom. All I needed to do was keep that up for another five hours, and I’d be golden. I kept chugging along and could not believe how evenly I was running: 11:31, 11:33, 11:30. I have never prided myself on my ability to pace a run, particularly during a marathon, so this was blowing my mind. I was a little worried when I ran mile six in 11:46, so to make up time, I aimed for an 11:15 next mile so they’d even out to 11:30. The result: an 11:12. Who was I?! Back downtown, I got passed by a 4:55 pace group that I assume came from Corral H (the only other 4:55 pace group was in Corral L, the last corral, and I can’t imagine they had caught up to me in 12 miles). Even though the group passed me, they didn’t really seem to be gaining on me, at least not by much. I didn’t know what a 4:55 pace boiled down to in terms of pace/mile, so I decided if I could still see them after I passed the halfway point, I’d catch them, see how fast they were running, and go from there. It turned out that they were running an 11:00 pace (I hit mile 14 in 11:04). I knew that’d be too tough for me to sustain for the entire second half, so I dropped off and continued running my own race. The miles were ticking by, and all things considered, I was feeling fantastic. I started dumping water on my head at the Boystown aid station in an effort to keep cool, and when I got a sponge in Old Town, I stuffed it in my sports bra and hung onto it until I turned onto Columbus. At every aid station, I’d get a cup of water to drink (or two) and a cup of water to dump on my sponge. I’d squeeze the sponge over my head, then tuck it back into my bra until the next aid station. I also started eating pretzels at mile 15 (10 pretzels + 5 Honey Stinger chews at mile 15, 10 pretzels + 5 Honey Stinger chews at mile 20, 10 pretzels at mile 23.5) to get some salt back in my system. This seemed to do the trick. It was still hot, no doubt, especially in the sun, but making sure I was super proactive about staying cool and staying salted (and not running too hard) made an enormous difference. It did also lead to a little underarm chafing, but if that’s the price I have to pay to keep running and stay out of the med tent, so be it. I never had to walk other than the times I got crowded in at aid stations, which also made me quite happy. I know Michigan Ave. is always tough, so I really didn’t want to push my luck by dropping the hammer with 5K left to go. I kept up with my hydration/cooling system at the first two Michigan Ave. aid stations, but when I got through the second aid station a little bit past mile 24, I realized that this was really going to happen. I wasn’t going to break five hours, and I wasn’t going to PR, but I was, finally, after five years of trying, going to have a good marathon. I let my legs do whatever they wanted, and they wanted to go, so off we went. After a 12:05 mile 23 and a 12:05 mile 24, I hit mile 25 in 11:26–my third fastest mile of the race up to that point–and, though I don’t have an exact split since I didn’t see mile 26, my Garmin map says I crossed what appears to be mile 26 on the course map at 5:01:49 on my watch. I hit mile 25 at 4:50:46. That means I ran an 11:03 miles–my fastest mile of the entire day–for the last mile of the race. My last 2K split, between 40K and the finish? 10:36. I was deliriously happy. 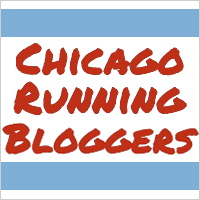 I waved to a video camera stationed at the corner of Michigan and Roosevelt, and the lady standing next to the person filming commented on how good I looked (pleaseohpleaseohplease let that be official marathon people and let me end up in a promo video for next year’s race. I would be so thrilled if that happened! Haha.). I flashed a huge smile and a double thumbs up to the photographers at the top of Mt. Roosevelt (!! Gonna buy those race pictures for SURE.). I sobbed my way down Columbus and across the finish line. After six tries, five years, 157.2 marathoned miles, I had finally, finally, finally run a good marathon. It took me 5:04:09 to do it (#3 out of six time-wise), but I don’t care at all. This finish was so much more satisfying than either of my sub-5:00 races. This was the one distance I had left to conquer, the one race I just couldn’t figure out, and I finally did it. I crossed the start line on Sunday not knowing whether or not I’d ever run a marathon again. I crossed the finish line on Sunday knowing that I will definitely be back for more. Yessss!!!! I am SO, so happy you had such a great race! That’s how I felt at my marathon earlier this year, and it was really unbelievable. I was happy to meet my time goal, obviously, but the best part was that it felt good the whole time. I had historically paced my marathons poorly too and I was shocked that I could run faster in the second half than the first half. It really made all the difference in how I felt overall and how the whole day went. I’m so glad you finally conquered the marathon! Proud of you! Yes! I never imagined that I’d be happier about feeling good for the duration of a race than about hitting a time goal, but man, I’ve been on cloud nine ever since Sunday. It made all the difference in the world and totally re-energized me for running (after several more days of recovery, obviously. Haha.). Yay!!!! Congrats on figuring it out and running your best race!!!! That is the best feeling!!! Thank you!! And yes, it really is! I was so sure I’d be bummed out if I didn’t break 5:00 this year, and I’m still not even the teeniest tiniest disappointed about my finishing time. The way I felt for the duration of the race more than made up for it! Congratulations on having such a great race!! I’m glad you finally feel like you redeemed yourself out there. That’s got to be such a great feeling. You should be very proud – you are one of the very few people who can say they had a good race on Sunday. It was BRUTAL out there! There was a mile 26 sign, btw. 🙂 It was RIGHT after the 400M left to go sign, so I’m sure a lot of people missed it. Thank you! It truly was incredible. I’m still giddy over it, honestly. How did you hold up on Sunday? Ahhhh no!!! Man, I can’t believe I missed it! I can see the 400M sign in my head, but I have no recollection of the 26 mile sign at all! (Even though I think I remembered it being there in the past.) Oh well. I’ll have to pay better attention next time! I did okay on Sunday. Big ol’ PW and positive split. The 2nd half was brutal and I had to walk a lot, but I honestly didn’t really care about my time and wasn’t expecting much of myself after this training, so I was fine with it. It was definitely the hardest I’ve had to work for a marathon finish. My first three marathons all went really, really well, I’ve definitely been spoiled by success in this distance, so I was okay to let this one go and have a “just finish” day. Wooohoooo!! CONGRATS!!!! It’s awesome that you had such a good experience. I always managed to get injured right before the marathons so never felt truly great about my runs – maybe one day!! I hope you’re recovering well! Congratulations on a great finish! It was tough out there.